There is a lot of variation in the willingness to pay for geriatric care. That is the main conclusion of Netspar’s research on the extent to which people are able and willing to pay for their own moderate levels of geriatric care themselves. 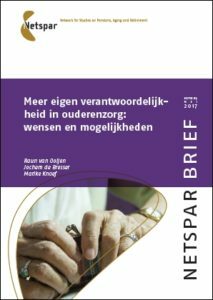 Although the majority of the Dutch expect health care costs to increase and the pension is insufficient, there is a lot of diversity in how households handle this. A large part saves out of precaution. An equal share cannot manage this, and will depend on a social safety net from the government. Customization is required to take this diversity into account. In addition, insurance for home care can prevent people from saving too much. Finally, a social safety net is needed to prevent major inequalities (for example for caregivers).